In just a few simple steps you can have a delectable side dish that can be paired with practically anything! Preheat your oven to 400 degrees (nice and hot). Prep your asparagus by using a peeler to take off the rough skin at the bottom. This helps keep that nice soft consistency through the whole piece. 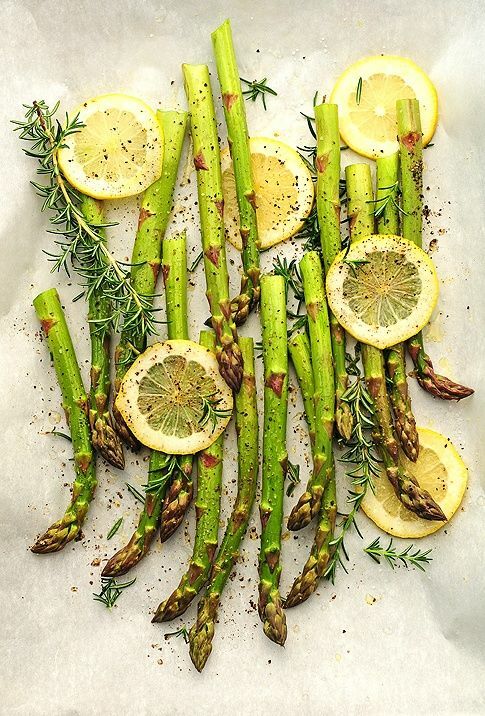 Place your asparagus on a baking sheet, drizzle olive oil and salt & pepper over your stalks. Slice up half of the lemon and place the other half that you cut into wedges between your asparagus. Squeeze the juice of the half a lemon on top of your stalks. Sprinkle or place 2 sprigs of fresh rosemary with your asparagus and pop in the oven! Keep an eye on them, but in about 35-40 minutes (or until browned to your liking) they are ready to be taken out of the oven and enjoyed. Tips! This side dish can be indulged as an entree. Sprinkle some goat (or crumbled feta) cheese on top and drizzle some honey on top. You will have a salty/sweet bite in under an hour. Not sure what to pair them with? Salmon, grilled chicken or a pork chop are my favorite sources of protein for these guys.